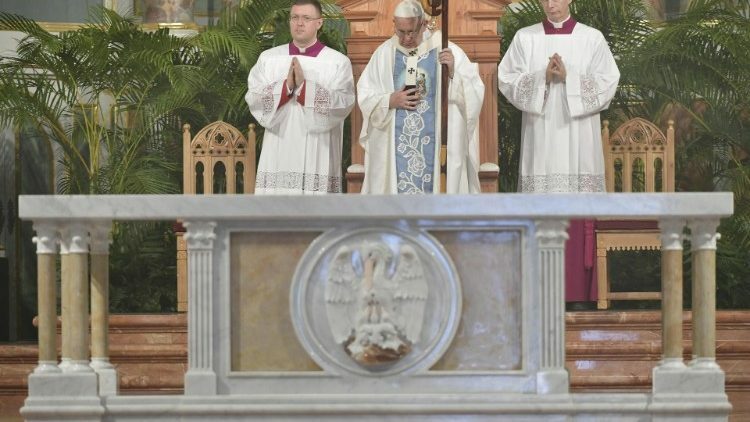 Pope's homily at Mass in Panama's Cathedral: Full text. “Jacob’s well was there, and so Jesus, wearied as he was with his journey, sat down beside the well. It was about the sixth hour. There came a woman of Samaria to draw water. Jesus said to her, ‘Give me a drink’” (Jn 4:6-7). The Gospel we have heard does not shrink from showing us Jesus, wearied from his journey. At midday, when the sun makes all its strength and power felt, we encounter him beside the well. He needed to relieve and quench his thirst, to refresh his steps, to recover his strength in order to continue his mission. The disciples personally experienced the extent of the Lord’s commitment and readiness to bring the Good News to the poor, to bind up the brokenhearted, to proclaim liberty to captives and freedom to prisoners, to comfort those who mourn and to proclaim a year of favour to all (cf. Is 61:1-3). These are all situations that consume life and energy; yet they show us many important moments in the life of the Master, moments in which our humanity, too, can find a word of Life. It is relatively easy for us, compulsively busy as we are, to imagine and enter into communion with the Lord’s activity. Yet we do not always know how to contemplate and accompany his “weariness”; it seems this is not something proper to God. The Lord knew what it was to be tired, and in his weariness so many struggles of our nations and peoples, our communities and all who are weary and heavily burdened (cf. Mt 11:28) can find a place. There a many reasons for weariness on our journey as priests, consecrated men and women, and members of lay movements: from long hours of work, which leave little time to eat, rest and be with family, to “toxic” working conditions and relationships that lead to exhaustion and disappointment. From simple daily commitments to the burdensome routine of those who do not find the relaxation, appreciation or support needed to move from one day to the next. From the usual and predictable little problems to lengthy and stressful periods of pressure. A whole array of burdens to bear. It would be impossible to try to cope with all these situations that assail the lives of consecrated persons, but in all of them we feel the urgent need to find a well to quench our thirst and relieve our weariness from the journey. All these situations demand, like a silent plea, a well from which we can set out once more. For some time now, a subtle weariness seems to have found a place in our communities, a weariness that has nothing to do with the Lord’s weariness. It is a temptation that we might call the weariness of hope. This weariness is felt when – as in the Gospel – the sun beats down mercilessly and with such intensity that it becomes impossible to keep walking or even to look ahead. Everything becomes confused. I am not referring to that “particular heaviness of heart” (cf. 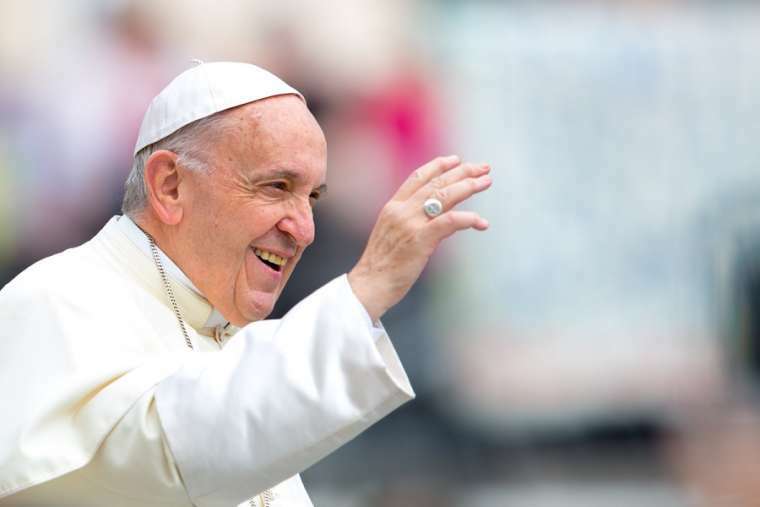 Redemptoris Mater, 17; Evangelii Gaudium, 287) felt by those who feel “shattered” at the end of the day, yet manage a serene and grateful smile. I am speaking of that other weariness, which comes from looking ahead once reality “hits” and calls into question the energy, resources and viability of our mission in this changing and challenging world. It is a weariness that paralyzes. It comes from looking ahead and not knowing how to react to the intense and confusing changes that we as a society are experiencing. These changes seem to call into question not only our ways of speaking and engaging, our attitudes and habits in dealing with reality, but in many cases they call into doubt the very viability of religious life in today’s world. And the very speed of these changes can paralyze our options and opinions, while what was meaningful and important in the past can now no longer seem valid. The weariness of hope comes from seeing a Church wounded by sin, which so often failed to hear all those cries that echoed the cry of the Master: “My God, why have you forsaken me?” (Mt 27:46). We can get used to living with a weariness of hope before an uncertain and unknown future, and this can pave the way for a grey pragmatism to lodge in the heart of our communities. Everything apparently goes on as usual, but in reality, faith is crumbling and failing. Disappointed by a reality that we do not understand or that we think has no room for our message, we can open the door to one of the worst heresies possible in our time: the notion that the Lord and our communities have nothing to say or contribute in the new world now being born (cf. Evangelii Gaudium, 83). What once arose to be the salt and light for the world ends up stale and worn. Weariness from the journey can happen; it can make itself felt. Like it or not, we do well to have the same courage as the Master, and to say, “Give me a drink”. As was the case with the Samaritan woman and perhaps with each one of us, we want to quench our thirst not with any water but with the “spring of water welling up to eternal life” (Jn 4:14). Like the Samaritan woman who for years had been carrying the empty pitchers of failed loves, we know that not just any word can help us regain energy and prophecy in our mission. Not just any novelty, however alluring it may seem, can quench our thirst. We know, as she did, that neither knowledge of religion nor upholding options and traditions past or present, always makes us fruitful and passionate “worshipers in spirit and truth” (Jn 4:23). The Lord says, “Give me a drink”, he asks us to say those same words. To say them, let us open the door and let our wearied hope return without fear to the deep well of our first love, when Jesus passed our way, gazed at us with mercy and asked us to follow him. To say those words, let us revive the memory of that moment when his eyes met ours, the moment when he made us realize that he loved us, not only personally but also as a community (cf. Homily at the Easter Vigil, 19 April 2014). It means retracing our steps and, in creative fidelity, listening to how the Spirit inspired no specific works, pastoral plans or structures, but instead, through any number of “saints next door” – including the founders of your institutes and the bishops and priests who laid the bases for your communities – he gave life and fresh breath to a particular moment of history when all hope and dignity seemed to be stifled and crushed. “Give me a drink” means finding the courage to be purified and to recapture the most authentic part of our founding charisms – which are not only for religious life but for the life of Church as a whole – and to see how they can find expression today. This means not only looking back on the past with gratitude, but seeking the roots of their inspiration and letting them resound forcefully once again in our midst (cf. Pope Francis-Fernando Prado, The Strength of a Vocation, 42). “Give me a drink” means recognizing that we need the Spirit to make us men and women mindful of a passage, the salvific passage of God. And trusting that, as he did yesterday, he will still do tomorrow: “Going to the roots helps us without a doubt to live in the present without fear. We need to live without fear, responding to life with the passion of being engaged with history, immersed in things. With the passion of lovers” (cf. ibid., 44). A wearied hope will be healed and will enjoy that “particular tiredness of heart” when it is unafraid to return to the place of its first love and to find, in the peripheries and challenges before us today, the same song, the same gaze that inspired the song and the gaze of those who have gone before us. In this way, we will avoid the danger of starting with ourselves; we will abandon a wearisome self-pity in order to meet Christ’s gaze as he continues today to seek us, to call us and to invite us to the mission. For me it is no small thing that this cathedral now reopens its doors after a lengthy renovation. It has experienced the passage of the years as a faithful witness of the history of this people, and now with the help and work of many it wants once more to show us its beauty. More than a formal restoration, which always attempts to reproduce the original appearance, this restoration has sought to preserve the beauty of the past while making room for all the newness of the present. A Spanish, Indian and Afro-American cathedral thus becomes a Panamanian cathedral, belonging both to past generations and to those of today who made it possible. It no longer belongs only to the past, but it is a thing of beauty for the present. Today it is once more a place of peace, that encourages us to renew and nurture our hope, to discover how yesterday’s beauty becomes a basis for creating the beauty of tomorrow. That is how the Lord works. Brothers and sisters, may we not allow ourselves to be robbed of the beauty we have inherited from our ancestors. May it be a living and fruitful root that will help us continue to make beautiful and prophetic the history of salvation in these lands.